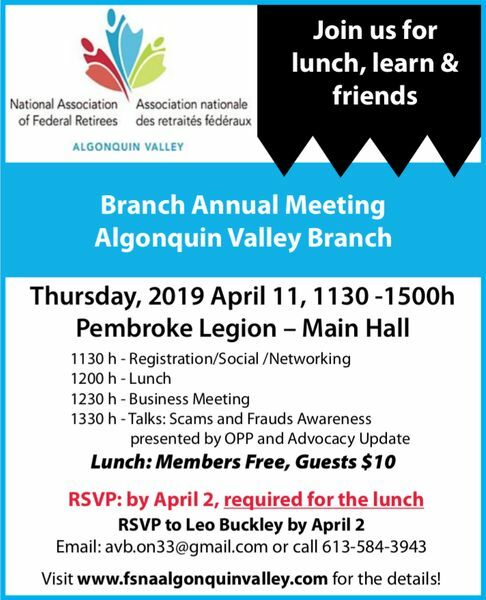 Welcome to the website of the Algonquin Valley Branch (AVB) of the National Association of Federal Retirees. The Association is a Not-for-Profit Corporation with its headquarters in Ottawa and a membership of approximately 175,000 individuals distributed all across Canada. anyone who is receiving a survivor benefit from the pension plans mentioned above. The AVB serves Renfrew County and organizes a diverse range of local events. The Branch has approximately 2,150 Members, and its activities are organized by a volunteer Executive and Members who serve on committees. The AVB works closely with the Association’s National Office and in cooperation with the nearby branches serving Ottawa, the Ottawa Valley, and Cornwall & District. Broadly-speaking, the Association’s work is to significantly improve the quality and security of retirement for our members and all Canadians through advocacy and the provision of services. In addition, Members benefit from a wide range of discounts and enhanced services provided by our Preferred Partners. For more information and to join us, please click on the links below. We look forward to seeing you at our next event! The AVB report that appears in the Fall 2018 issue of SAGE is available here. NOTE: CAA contact information as listed in the Fall Report is no longer valid. The schedule of Branch events in 2019 is available here. As part of the Association's campaign to oppose Bill C-27 in its current form, the AVB Advocacy Committee discussed the Bill at a meeting with our MP Cheryl Gallant on March 15, 2017. Our report from the meeting is available here. Are you considering going back to work? For a few tips read Leo Buckley's "Returning to Work After Retirement" article on the subject. greater than your annual membership fee to the Federal Retirees.